Norwegian has chosen 'Burns Night' to proudly to announce that Scottish poet Robert Burns will become its first Scottish ‘tail fin hero’. The renowned poet’s portrait will grace the tail fin of a Norwegian Boeing 787 Dreamliner aircraft which will take to the skies later this Spring. The announcement comes on Burns Night, an annual event to celebrate the life and work of Robert Burns on the anniversary of his birthday – 25th January. The first Burns supper was held in July 1801 when Burns’ close friends got together to mark the fifth anniversary of his death. The night included performances of Burn’s work and was such a resounding success they decided to hold it again, beginning the tradition of Burns Night! To reflect Norwegian’s rapid growth in the UK, where it now flies 5 million UK passengers each year to more than 50 destinations, the airline is planning a series of UK tail fin heroes. 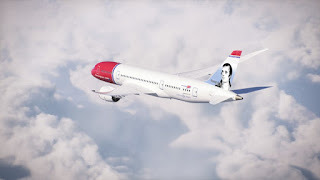 Robert Burns will become Norwegian’s sixth UK tail fin hero and first Scottish hero, following the announcement of rock legend Freddie Mercury, footballer Bobby Moore, children’s authorRoald Dahl, pioneering pilot Amy Johnson, author Jane Austen and aviation maverick Sir Freddie Laker. Robert Burns, born in 1759, went on to become a globally renowned poet. His best-known work is ‘Auld Lang Syne’ which is now sung at New Year’s Eve celebrations across Scotland and other parts of the world. Other famous poems include To a Louse, To a Mouse and The Cotter’s Saturday Night. Norwegian, Europe’s third largest low-cost carrier, first began operations at Edinburgh Airport in 2009 and has since flown more than 1.5 million passengers to Europe and transatlantic. Norwegian operates transatlantic flights from Scotland direct to smaller airports on the US east coast – Stewart International Airport and Providence International Airport, offering easy access to New York City and Boston.